Avalue Technology has been developing IoT Smart Retail Solution for some time before collaborating with Microsoft to make its debut in Computex 2016. Later Avalue also announced its official partnership with Microsoft Azure IoT Suite. A press conference took place on September 9th at Avalue’s Taipei office, demonstrating Smart Retail Solution by letting the press be the customer in a recreated retail scenario. The whole experience includes installing mobile APP to receive push notifications on store events, doing facial recognition for product suggestion; as well as getting to know how retailers can benefit from the solution by receiving analysed business report and traffic flow. Living in an era when online shops are stronger than ever, it is vital that owners of brick-and-mortar shops create more personalised customer experience in order to generate business and bring value. A presentation on Avalue’s IoT Smart Retail Solution was briefed to kick off the conference. Several products from Avalue’s offerings were certified with Microsoft Azure Certification. Avalue also announced its participation in Microsoft Azure IoT Suite’s Enterprise Agreement earlier in July. With this partnership, not only does Avalue have access to the Enterprise Portal, which allows Avalue to manage multiple accounts or subscriptions; Avalue also can take advantage of Azure’s best prices based on the infrastructures spent, which is provided on top of per meter prices for commodity services like compute, storage and bandwidth. After exiting the meeting room, using beacon and LBS technology, participants were navigated on a customer journey to shop and collect points. At the shop, Azure Cognitive Service’s Facial Recognition API was deployed to distinguish customer’s gender and age range so the digital signage could introduce and display the recommended merchandise. Later on, transactions were made with Avalue’s All-in-One Mini POS, RiPAC, and mobile POS, RiTAB, then transmitted, recorded and analysed at Azure. This cloud based solution allows retail owners to have access to the most updated business report whenever they want and wherever they are. Lastly, Avalue demonstrated how they can help retailers to track and analyse foot traffic and dwelling time, so store owners can adjust store layout and merchandise position accordingly and in turn increase revenue. Director of Intelligent Solution and System, Mr. Jason Liu, pointed out that Avalue’s IoT Smart Retail Solution will integrate real time inventory management, which allows the system to detect inventory level and run promotions. Also, enlarging the solution scope by integrating other devices and technologies is also in the plan. 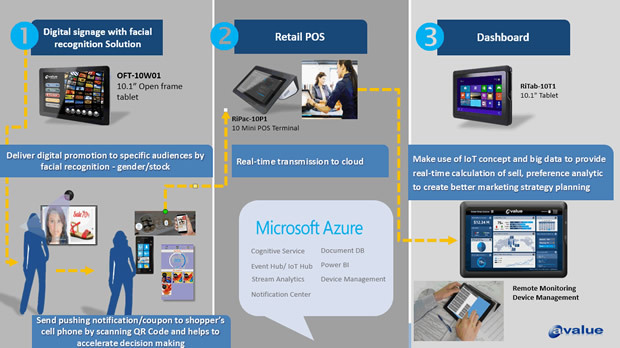 Avalue’s IoT Smart Retail Solution, through Microsoft Azure, transmits the data that was collected by the end terminals to the middle layer for databasing and analysing. Then the analysed information will be sent to the cloud for further computing, analysing and in the end applied to smart solutions. To retailers, this whole process of big data collecting and analysing used to be outsourced to system integrators or assigned to in-house IT personnel, sales personnel and accountants, which often took up a lot of time and cost. However, with Avalue’s cloud based IoT Smart Retail Solution, all the sales report, business analysis are all at the fingertips. More from Avalue Technology Inc.